Emile Griffith, a former welterweight and middleweight boxing champion, and a member of the International Boxing Hall of Fame, passed away in a Long Island nursing home on Tuesday, July 23, at age 75. Griffith may be best known for a tragic 1962 fight in which his opponent, Benny Paret, died after being pummeled by Griffith--an incident that is said to have haunted Griffith ever since. He was also known for his openly gay lifestyle, a rarity in boxing. In his later years, the boxer suffered from pugilistic dementia--a neurological problem, sometimes called being "punch-drunk," caused by blows to the head. I had the opportunity to meet Griffith briefly in December of 2010, at the holiday party of Ring 8, one of two Veteran Boxers Associations in New York that help support retired fighters and other members of the boxing community who are experiencing medical and financial problems (the other is Ring 10, of which I'm a member). At the event, it was clear that Griffith suffered from memory issues--for example, he did not appear to recognize a friend of mine who greeted him, although he had known her well in better days. And he had obvious difficulty in chatting and signing autographs, although his painful struggle to do both for each person who approached was an indication of what was, by all accounts, his warm and generous nature. Rest in peace, Mr. Griffith. I've heard about Rush for years without ever quite knowing who they were. I'm talking about Rush the band, of course, not radio host Rush Limbaugh. Thankfully, I've long known who Limbaugh is--the "doctor of democracy," as he calls himself, who injects three hours of common sense daily into America's diseased body politic. But I never had a true sense of the musical Rush. Just a few hints. "I love seeing Geddy Lee"--Rush's bassist, keyboardist and lead singer--"throw himself on his back and kick his legs like a bug!" my niece told me a few decades ago. A male cousin, sometime back in the day, gave me a Rush cassette tape, which I never quite got around to listening to. 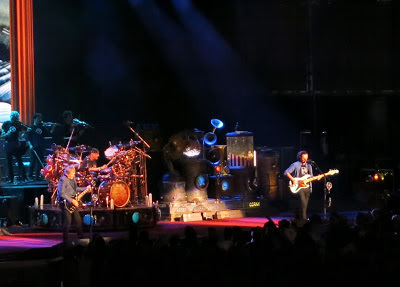 More recently, Facebook brings me from family and friends periodic rave reviews of Rush shows they've attended. 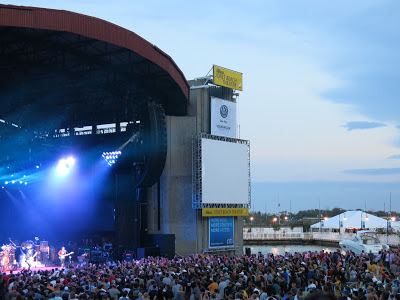 So seeing Rush live became yet another item on my bucket list--and I finally did, two Sundays ago, July 23, at the Jones Beach Theater, still one of the best places to see a summer concert. Rush consists of only three guys--Lee, guitarist Alex Lifeson and drummer Neil Peart--although they had some backup musicians at times during this show. But with or without backup, they make music of amazing richness and density. It's not an exaggeration to say that they play at a virtuoso level, with an ease and unity that reflects having worked together almost four decades. But, for those not familiar with it, the music is somewhat inaccessible, and suffers from a bit of sameness. They launched into their signature sound from the first song and, great sound though it is, sinewy and seductive, it didn't change much throughout the generous three-hour show. Onstage patter was limited to remarks like, "It's great to be back in this area," which I guess saves Lee from having to remember exactly what area he's in on any given night. 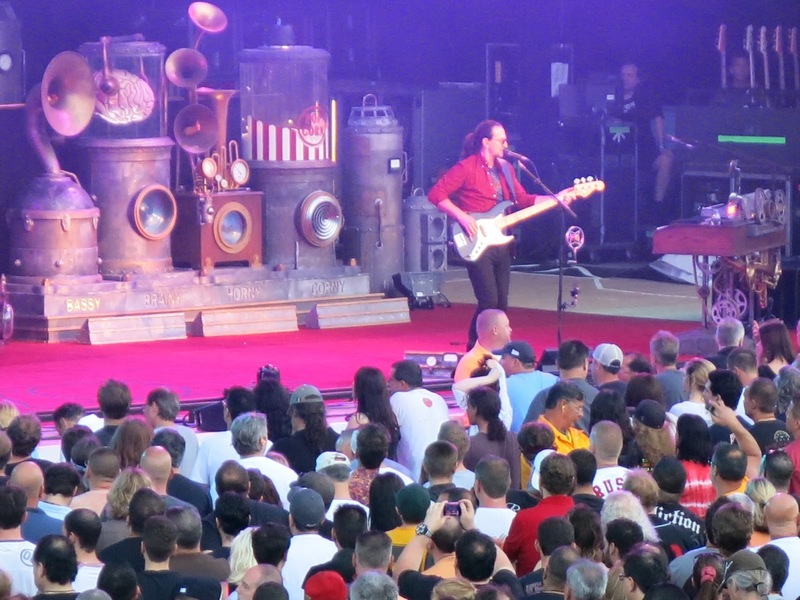 Pacing and variety, and there wasn't much of either, were provided by images and videos projected on the stage's large screens, occasional on-stage fire-and-smoke pyrotechnics, and one song that began with some powerful acoustic guitar by Lifeson. Lee's high, wailing, heavy-metal-style voice, which has been compared to "a munchkin giving a sermon," is fascinating to listen to--but forget about trying to catch the lyrics if you don't already know them. But this is not to say I didn't like the concert--only that I didn't know enough about their work fully to appreciate it. I did recognize "Tom Sawyer," with its distinctive keyboard riff, and I would have recognized the gracefully-written "Closer to the Heart," if they had done it. That's a start. And I've read since that Peart, who writes much of Rush's lyrics, considers himself a libertarian and has been influenced by the writer Ayn Rand, one of my own favorites. Once you know this background, lines like "No, his mind is not for rent / To any god or government" begin to come into focus. So I think I have more Rush concerts in my future, but a bit of study as well.